Top (Left to right): MAC: Studded Kiss (Matte), Illamasqua; sculpting palette, Origins, GingZing moisturiser. Bottom (Left to right): Elizabeth Arden Eight Hour Cream, Barry M; Gelly Hi Shine nail polish, Maybelline Great Lash Mascara. I'm going to be really honest, I can't wait for autumn. As much as I enjoyed the one or two days of summer I've had, I'm happy to pack away bikini's and summer dresses in favour of my oxblood jeans, capes and boots. It must be a northern thing to thrive in the colder weather and damper seasons. But with autumn brings a change in weather, which means I need a change in some of the products I use in favour of some more autumny goods. So I've created my first wishlist of the season - and really my first one in what feels like an age. I love a red lip, it's my trademark after all, so I won't be trading that in for winter, so I do feel like opting for a more vampy shade for the season and studded kiss by MAC screams just that. There's others similar, but I do love a matte lipstick, I think they last so much longer, and with the long days I planned in autumn, this ticks all the boxes - but don't worry, I won't be packing away my Ruby Woo all together. I've heard this little miss can do wonders for the face, and I'm dying to find new contouring and highlighting products that will define my features, which can often be lost with a rounder face. This palette boasts each powder glides onto skin effortlessly, allowing for swift blending and enviable sculpted definition created in seconds. Bloggers have raved, so I definitely need to try this. This has become quite the cult product of it's own and after a tester, it made it's way onto my wishlist. I tried it last autumn and had meant to purchase it, but instead waited too long and opted for a more spring time moisturiser. This autumn I'm excited to get my hands on this energy booster, which I have a feeling I'll need in the coming months. This will be more of a repurchase for me as I already own and love it, in fact you can review of it HERE. I do use this product all year round, mainly for my nose when I get the sniffles, but I love using it to keep my skin going in the harsher weather. This is an absolute bargain, and even after interviewing Laurence Llewelyn-Bowen earlier in the year, I must disagree that grey is the new beige, in a negative way (he loves colour - just not yellow, I do agree there) I love Barry M Barry Gelly polish, it glides on, last ages and really does shine, plus this colour will be very fitting for autumn in my opinion. Cheap, cheerful and a mega cult product. What's not to love about this, it's a legendary product I remember my mum buying me as a young teen and really does what it says on the tin. A great day to night product and it's waterproof - now I really can tackle a Cumbrian winter in style! 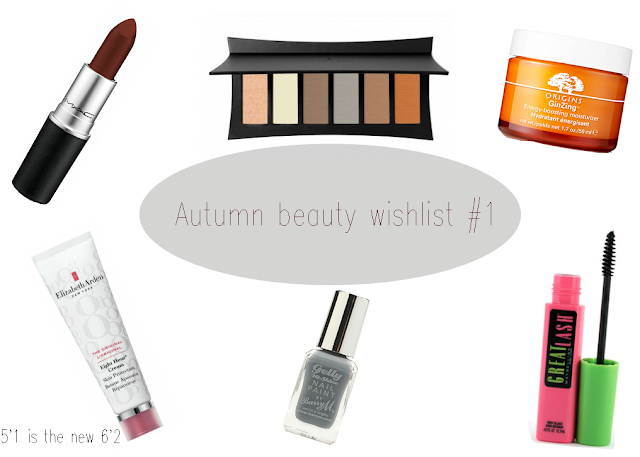 So this is my first wishlist of the autumn season. Though it's not autumn yet, and I actually got a sunburnt back today, I can't wait for the lovely fall to fall upon us. Have you compiled an autumn wishlist yet, if so leave your bloglovin' links below and please follow me (HERE)as I've entered their follower competition! I've been using a small GingZing moisturizer and I looooove it. I definitely need a full-sized version when it runs out. Beauty aside: Errm, thank you?